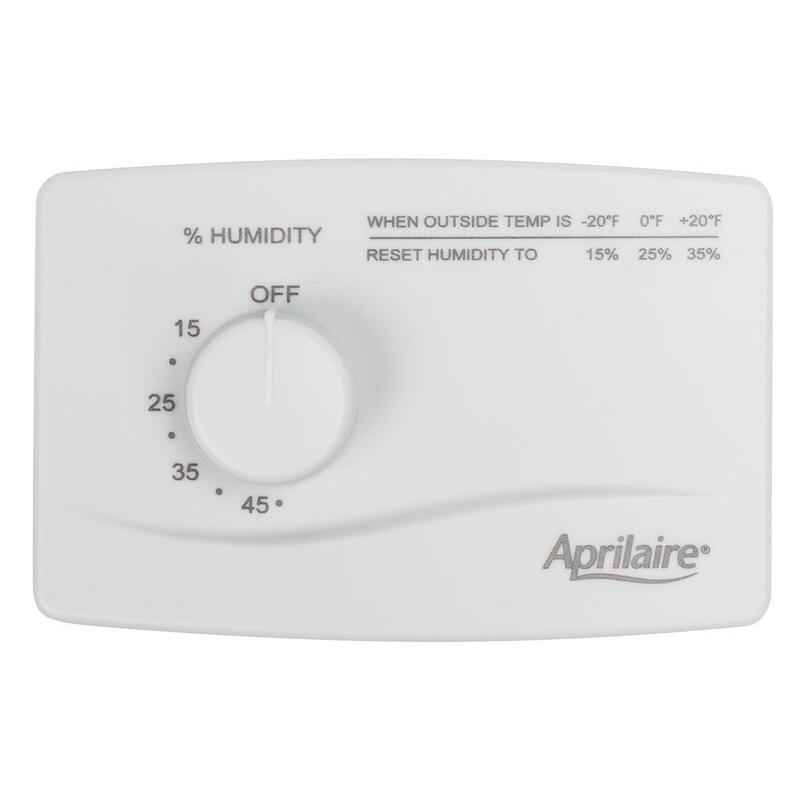 How Do I Set My Aprilaire Humidistat - RJ Kuhn, Inc.
Aprilaire humidifiers can preserve many of the wood products in your Oswego, IL. home during the dry winter months. However, if not set properly, they may produce more moisture than your home needs and if left unchecked for too long may eventually cause damage. Knowing how to set your humidistat is important to maintaining the proper moisture levels so we will discuss the proper steps. But first, we have to determine whether your humidistat is manually adjusted or automatically. • Manual Adjustment. You can identify a humidistat that has a manual adjustment by looking at the dial setting to see if there is an “auto” setting. If not, you have manual adjustment. These humidistats must be adjusted as outdoor temperature changes, less moisture as it gets colder; this will help avoid condensation from forming on the glass of exterior windows and doors. The chart on the face of the humidistat is quite simple to read, readjust humidity to 15% when outdoor temperature is at -20 degrees F, 25% when outdoor temperature rises to 0 degrees F and 35% as outdoor temperature rises to 20 degrees F. Some homes have better performing windows and doors than others, this chart is a guideline for the average home. If you feel that you have higher performing glass then the average home, try to turn the level up slightly above recommended setting. Attempt to set the humidistat between the 25% and 30% mark when it is 0 degrees out and watch to make sure moisture does not form on the glass surfaces along the exterior walls of your home. Try this when the sun is not shining directly on your home because the solar radiant heat may prevent the moisture from forming, but as soon as the sun goes down it may form at night meaning the level is too high for your glass. 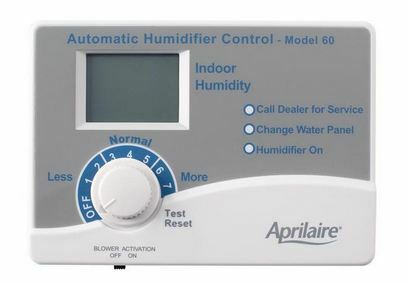 • Automatic Adjustment: There are two types of auto adjustment humidistats made by Aprilaire, one is digital and the other is analog. The only difference is that the digital humidistat has the ability to bring on the furnace fan on a call for humidity whereas the analog humidistat must wait for a call for heat from the thermostat for the furnace fan to engage and then humidity can be automatically added to the home. To set the moisture level, both humidistats operate identically. To start, set dial to “normal” selection, if you feel that you have a tight home, set to “5” in the normal range, “4” if you feel you have average home and “3” if you have an older home with looser construction. After allowing to operate for 24 to 48 hours, you may notice that minor adjustments may need to be made. If you feel the home is too dry, increase by increments of 1 from your initial setting and then wait 24 to 48 hours before adjusting higher again. If you initially notice water forming on your glass or after adjusting upwards, you will need to lower the setting by going down one level and allowing 24 to 48 hours to gauge if adjustment is satisfactory. Once you have locked in the setting that is right for your home, the humidifier will automatically adjust itself based on the outdoor temperatures. Always make notes of what setting was proper for your home, many people mark it right on the humidistat. The reason you need to remember your setting is that as we switch from heat to cool, we will want to ensure that the humidifier has been turned to the off position so it does not produce moisture while your cooling system is attempting to remove it. As always, the knowledgeable staff at RJ Kuhn in Oswego, IL. are always there to help you with all the questions that you may have with your Aprilaire product or any of your plumbing, heating or air conditioning needs.